I can remember the rush of adrenaline when I came across it. We were in a Waldbaum’s grocery store, not the one we typically went to, and they carried a small selection of DC’s 3-bag “Super-Pac” comics. The books in those bags were always several months old (to avoid competing with day-and-date distributors, I would think). The trick was always in determining what comic was in the middle. I was always too much of a goody-goody to rip or distort the bags, but there was a way if you maneuvered the books just right, you could get a peek at the middle title. 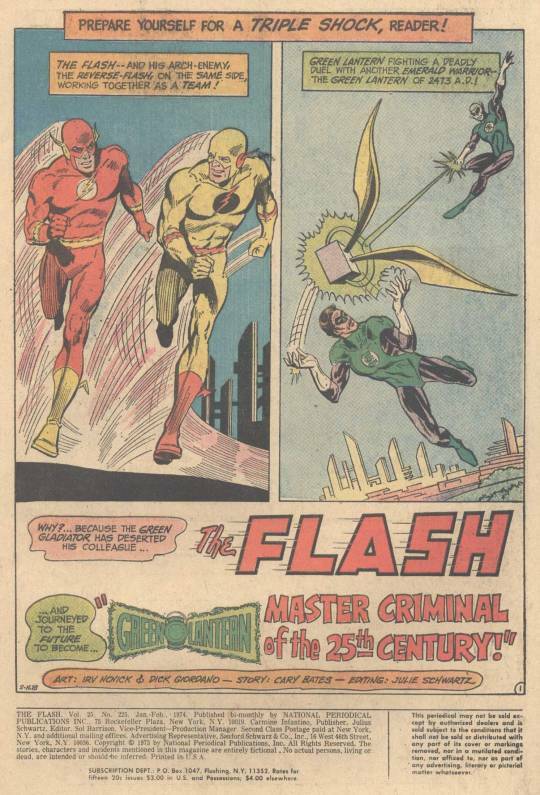 It was a 3-Bag with an issue of PLOP and an issue of SHAZAM on the outside–but sandwiched within was the elusive FLASH #225, the book that I had missed the previous year, the book with the full-length team-up between Flash and Green Lantern. In short, the most exciting comic book ever created. And now I had it, or thought I did. As it turned out, there was a problem. The problem was that this was a package that cost the same as three comics, and my Mom wasn’t about to buy me three books all at once. She agreed to buy the 3-Bag, but I had to give one of the comics to my younger brother Ken, then all of 3 years old. And, because it was the one I wanted, that FLASH issue was suddenly the one that Ken wanted, too. It was a long, drawn-out struggle/negotiation, but eventually I prevailed by letting him have both of the other books in the bag. And FLASH #225 was mine. And it was incredible! 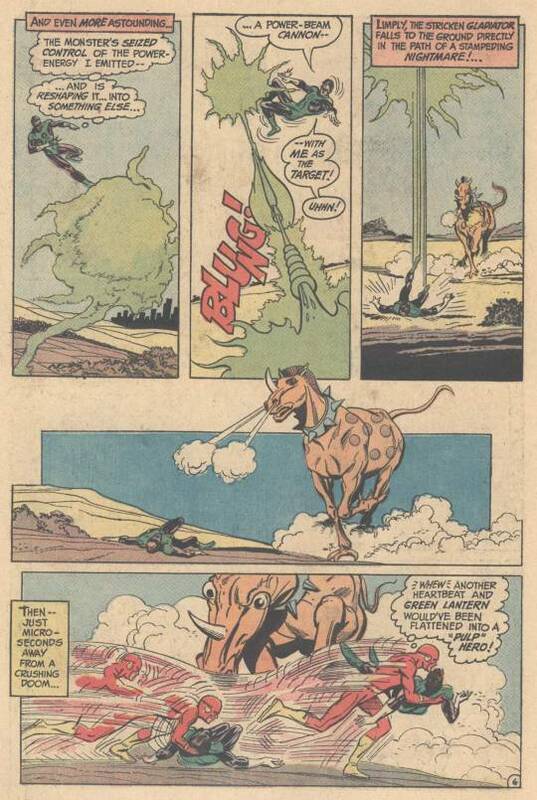 The issue opens with Barry and Iris Allen’s trip to the movies being interrupted by a rampaging Syntho-Steed, a gigantic horse with a horn that rampages through Central City. 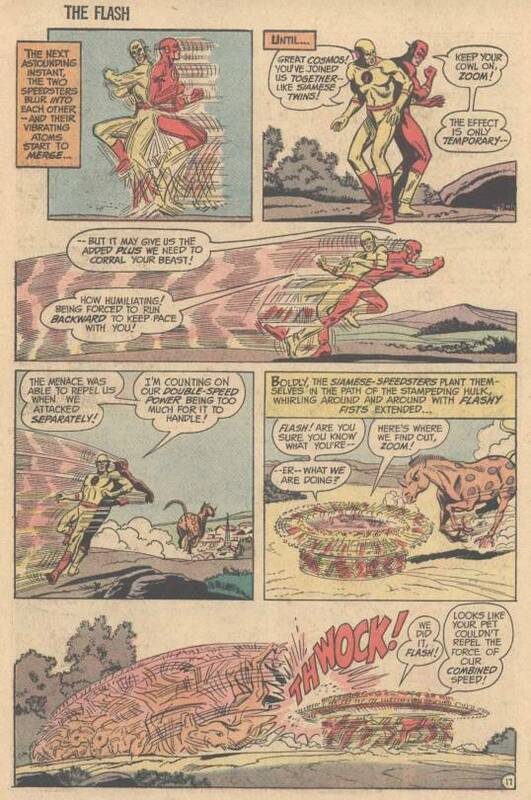 Barry becomes the Flash, but despite his best efforts, he can’t slow the wild horse-creature down. 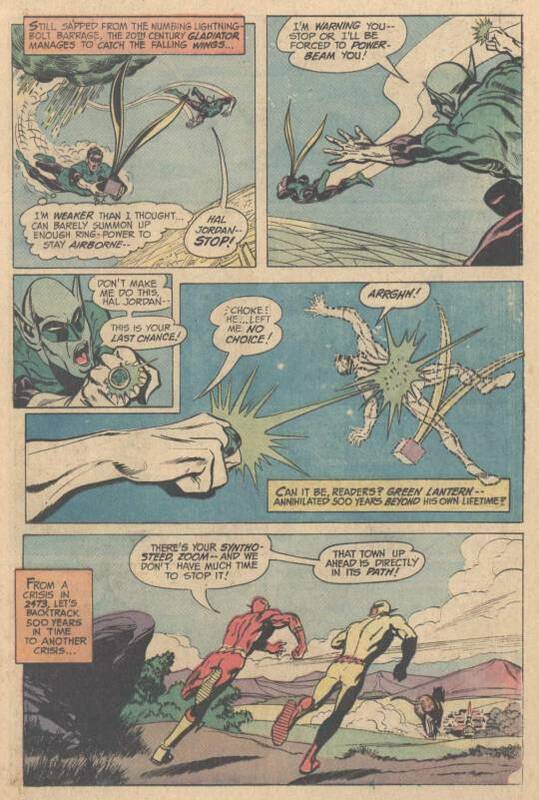 Neither can Green Lantern’s power ring when he similarly encounters the creature. But between the two heroes, they manage to tear its collar off, which reveals that the beast comes from the 25th Century. A trip through the time barrier confirms Barry’s worst fears: the Syntho-Steeds are a creation of his old foe Eobard Thawne, better known as Professor Zoom, the Reverse-Flash. Seeking out Zoom, the Professor agrees to help Flash destroy the rampaging monster–but only if Green lantern remains behind and steals for him a rare sculpture, the Raxalus Wings. 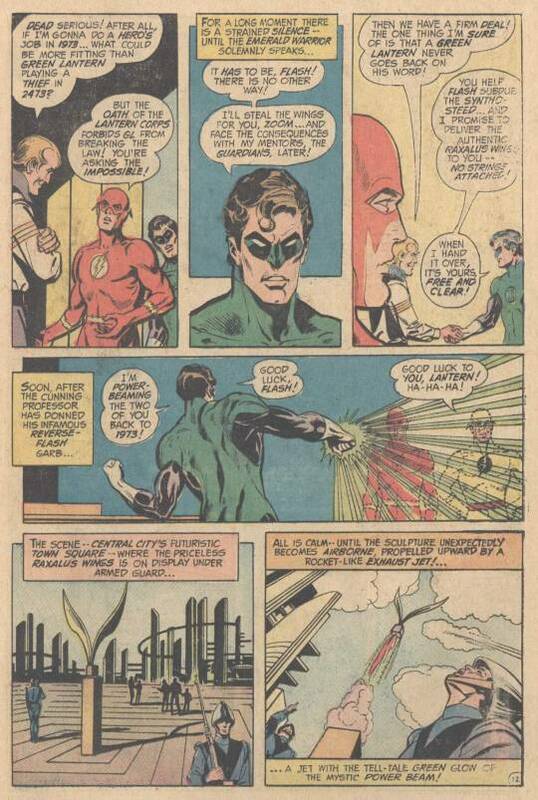 Despite his oath as a Green lantern, GL agrees to do so. 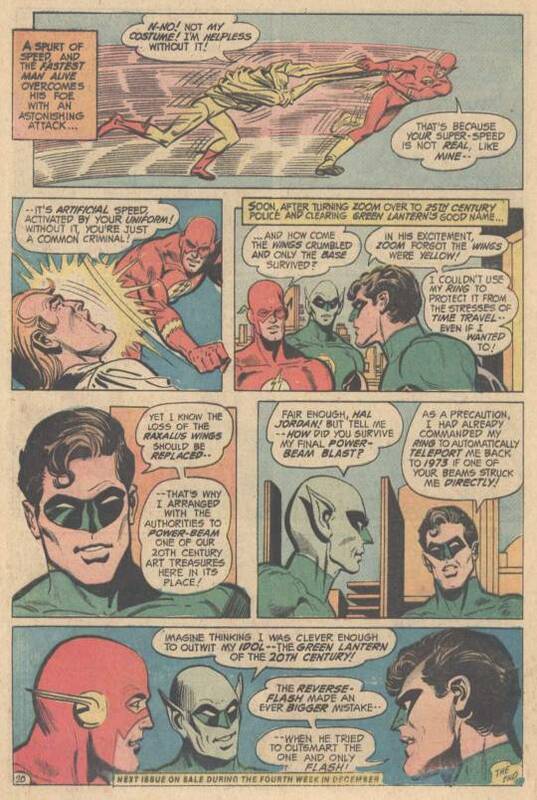 He power-beams the two Flashes back to 1973 (despite the fact that Zoom’s costume is almost entirely yellow) and moves to go steal the wings–only to be confronted by the Green Lantern of 2473! A fierce Power Ring duel follows, ending when the GL of the future seemingly disintegrates Hal Jordan. Meanwhile, in the present, despite Zoom’s knowledge of its make-up, the two Flashes are being batted around like pool balls. Barry comes up with a desperate strategy–by vibrating into intangibility, he combines his molecules with those of Zoom, counting on double-Flash power being enough to turn the tide. And it is. Then, Green Lantern appears, with the Raxalux Wings. But the Wings immediately disintegrate–being yellow, they couldn’t survive the time journey since GL’s ring couldn’t protect them (which, again, brings into question how Zoom did it.) 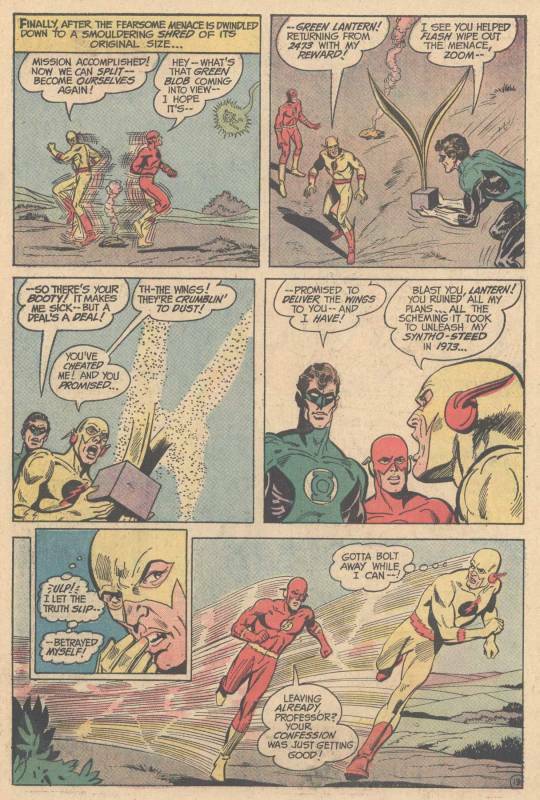 In his rage, Zoom reveals that this has all been a scheme of his to acquire the wings, and Barry quickly strips him of his speed-giving costume, thus capturing him. 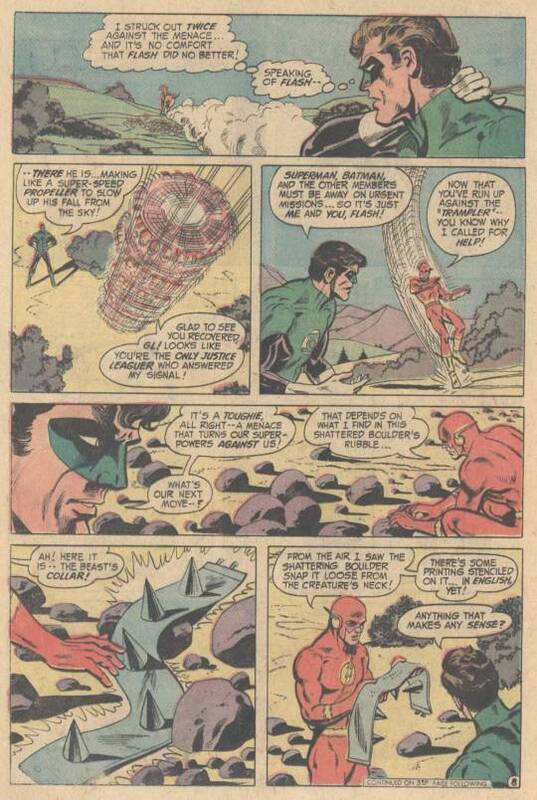 Returning to the future, GL explains to his future-counterpart that he’d ordered his ring to return him to the 20th Century if he was hit by his enemy’s attacks. He also reveals that he knew the wings would be destroyed, but he’ll replace them with some 20th Century masterpiece. Which seems incredibly suspect to me–if you destroyed the Mona Lisa, just being given another famous painting wouldn’t make up for that loss. But either way, everybody goes home happy, except for Zoom of course.